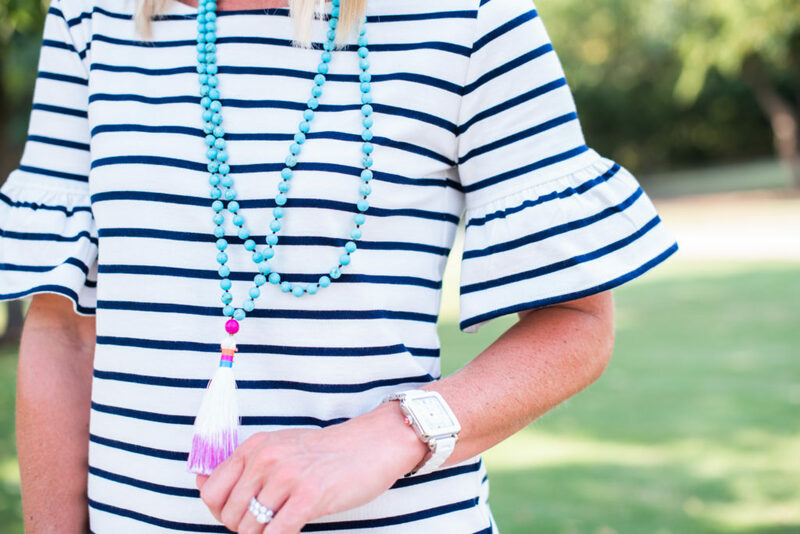 Summer of Style | Stripes & Tassels | hi Sugarplum! Welcome back to a new week, friends! That was a crazy-fast weekend, right?! Or rather, crazy-fast Summer! The kids return to school today, and I packed the first of (what feels like) 1087 lunches. Our break is officially over! 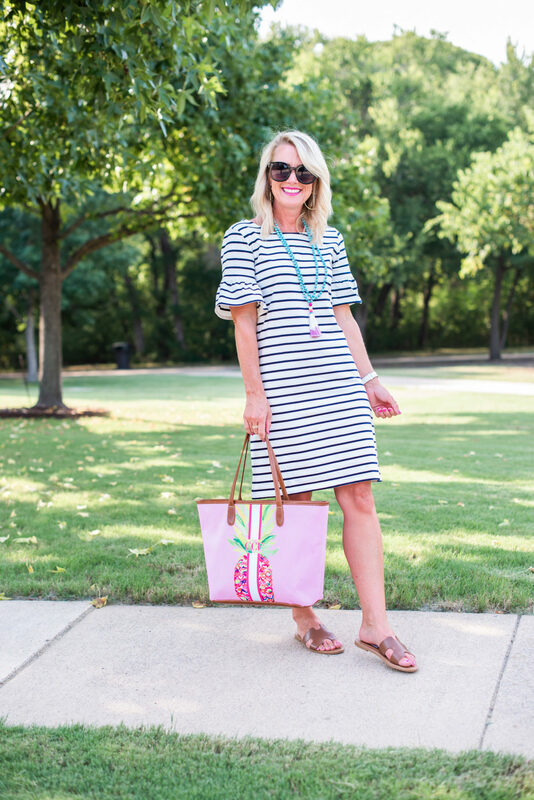 It may be back-to-school, but it’s still full-blown Summer weather, so we’re continuing our Summer of Style series a few more weeks, and today I’ve got the cutest t-shirt dress with ruffle sleeve detail (on sale!). 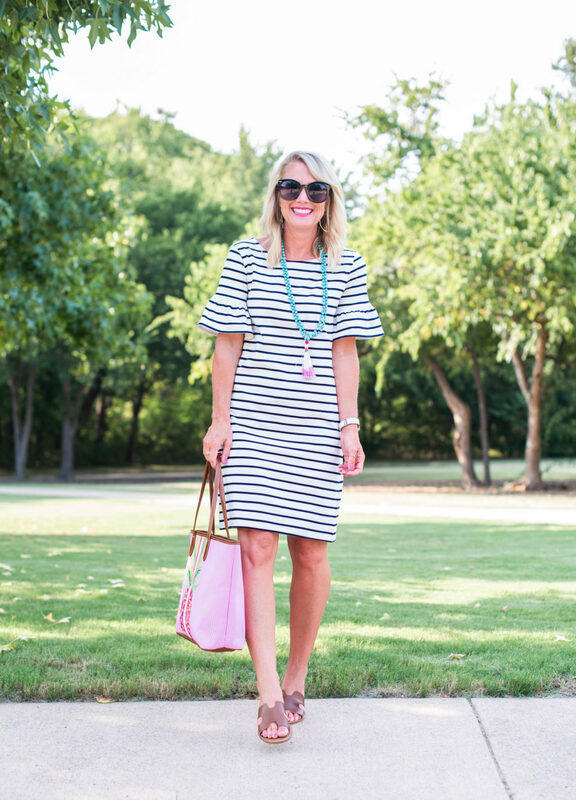 This classic striped dress is basic with a twist, thanks to the ruffle sleeves. 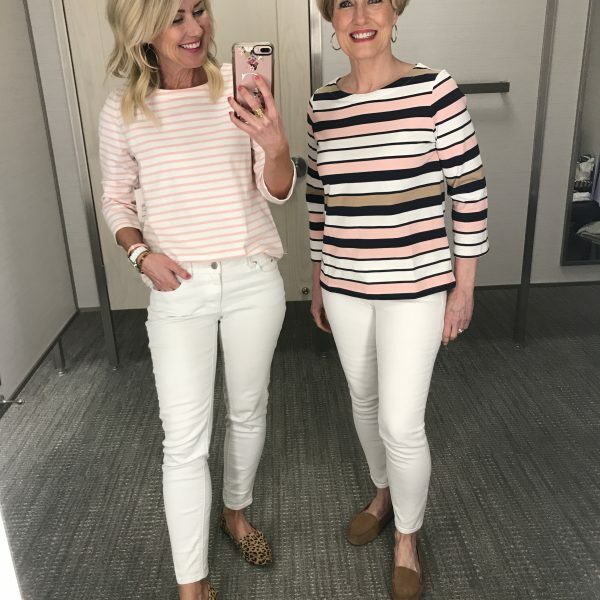 It’s a sturdy-thick cotton with just enough stretch, and falls just above the knee…making it perfect for work, church, etc. The sheath shape skims the body without hugging, and the sleeves are fitted through the shoulder. 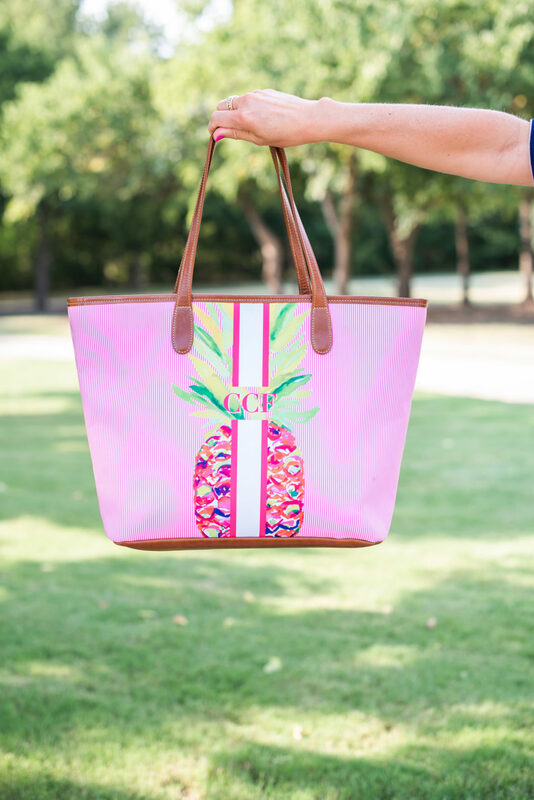 And it’s on sale!! Fit Tip: I’m wearing an XS dress. 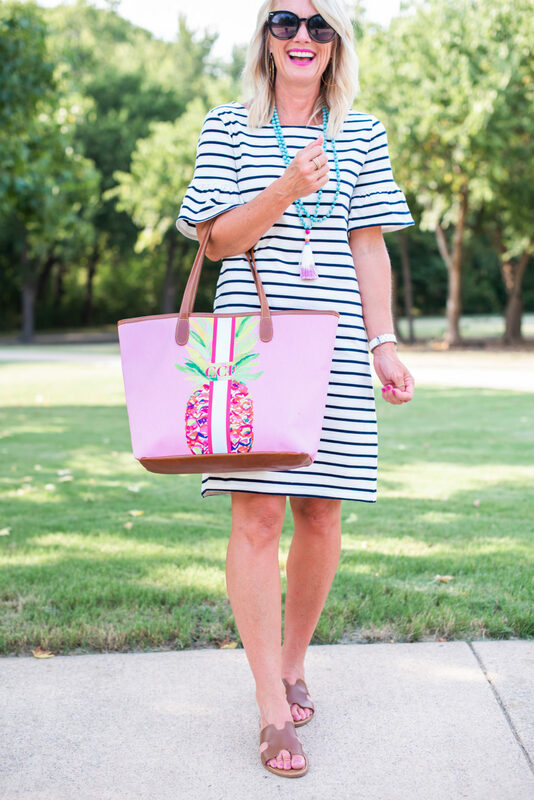 I, of course, jazzed it up with my go-to tassel necklace and a punchy bag. 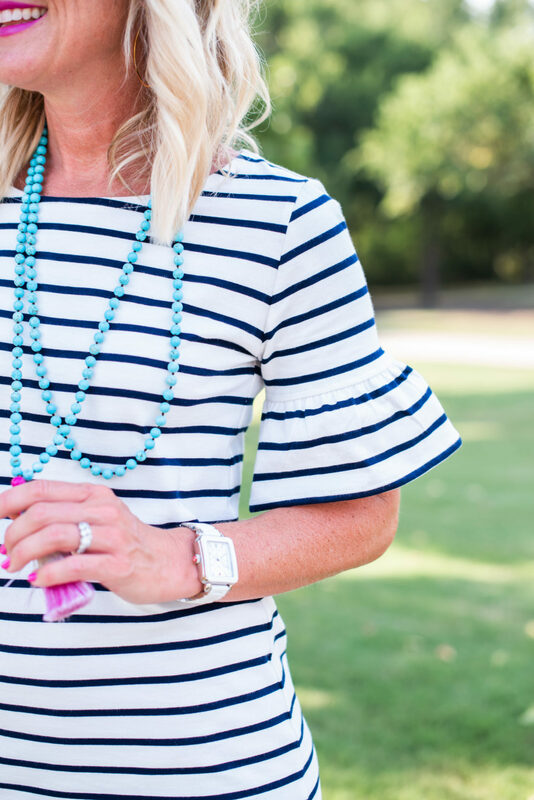 This necklace is proof that the addition of a single accessory can transform an outfit! 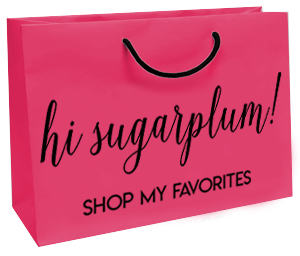 And both are on sale for Hi Sugarplum readers!! 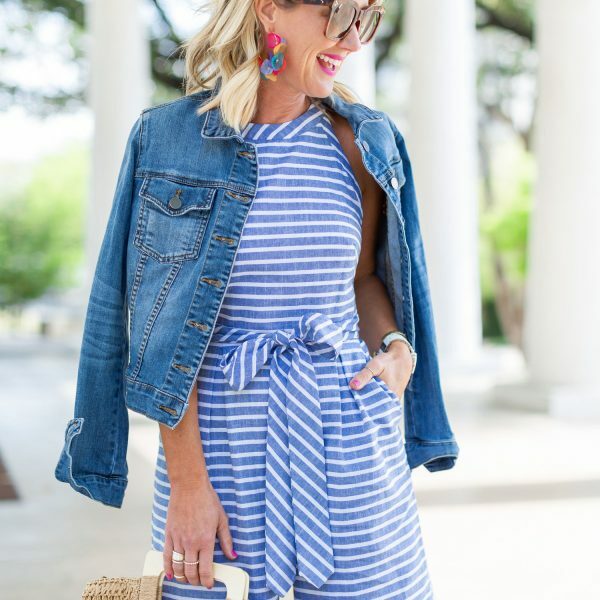 This dress would easily transition into early Fall with the addition of a jean jacket or field jacket (love this one and this one on sale). Now excuse me while I go count down the minutes until the kids come home! 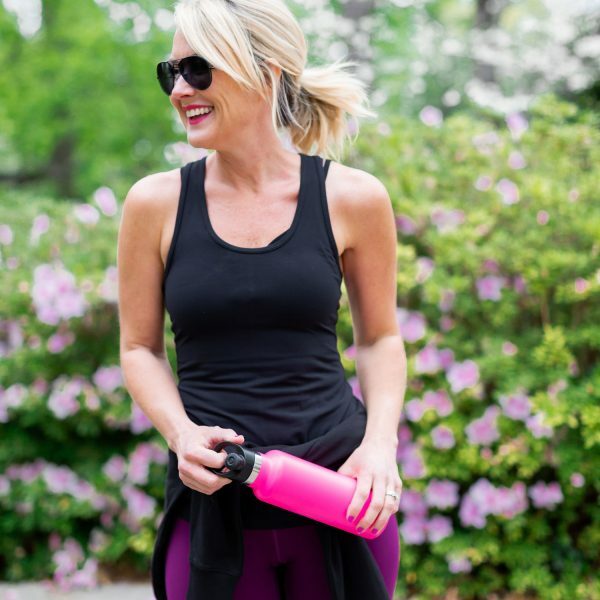 I can’t wait to hear how their day went…first-day stories are always entertaining! 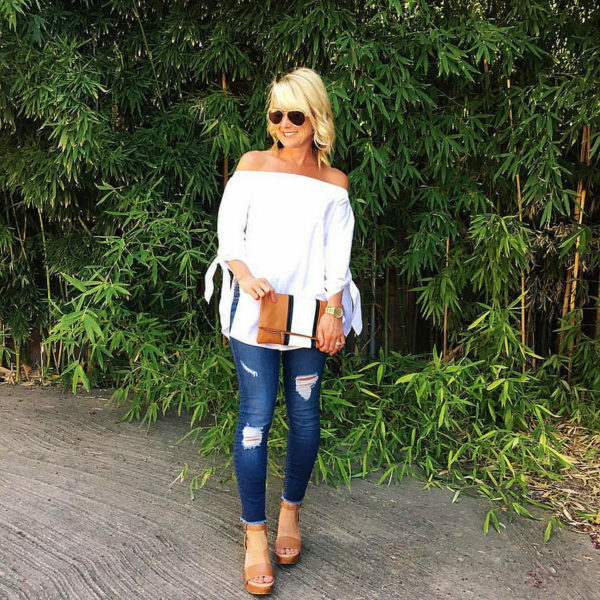 See more in my Summer of Style series here, and all Summer styles can be found here. next article: Project Little Miss | The Reveal! 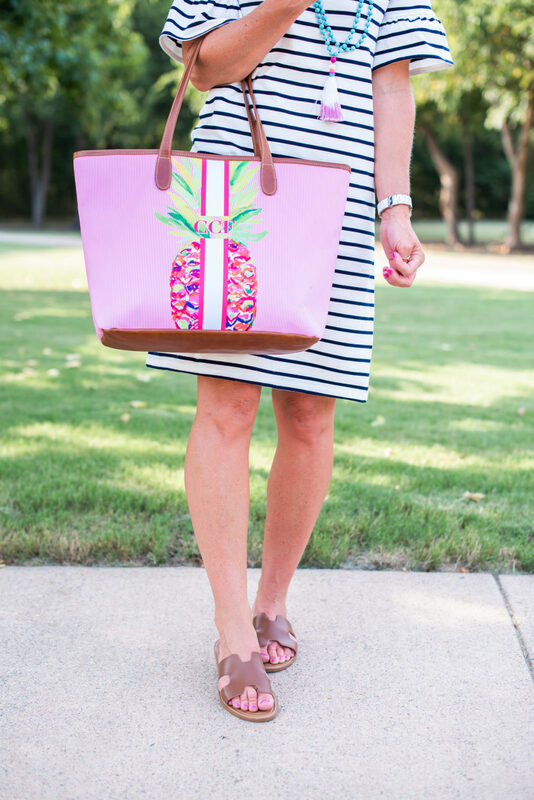 Head to tote, that outfit is PERFECTION! Cute comment by Shay! Totally agree. 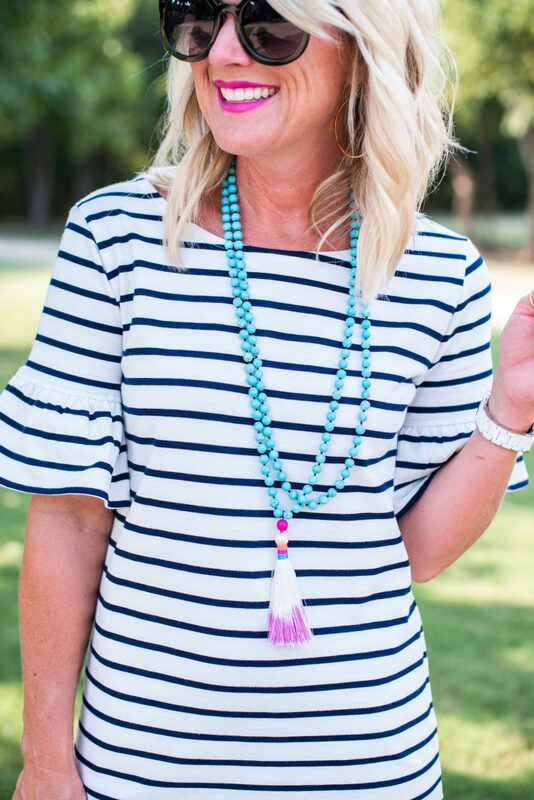 I had bought the other striped dress you had recommended and it is so comfy to wear when I am out and about, along with your tassel necklace! Sometimes I can’t believe that I have hisugarplum clothes and accessories (like the yellow-blue clutch and the leopard clutch) in my closet and drawers #totally blessed. I hope your darling kids have a super fun school year ahead. What size are you wearing in the dress? So cute! 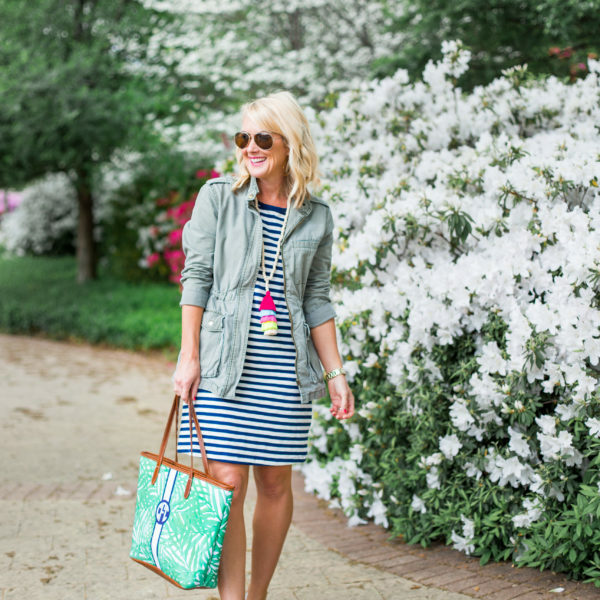 I mean, this is a precious dress! 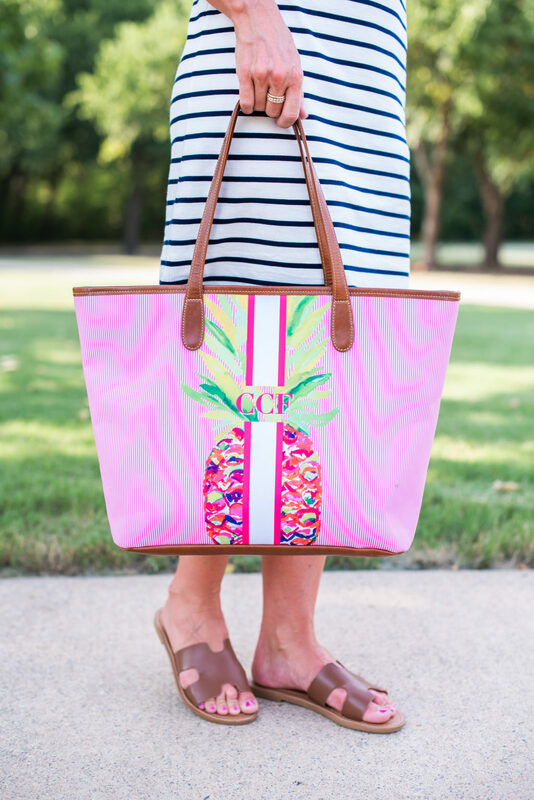 And you know I love the tassel and the bag. SO CUTE! I’m posting all about how I passed on the lunch making torch to my kids when they were in 3rd grade on my blog tomorrow and including some free printables if you need some ideas. I love your outfit today. 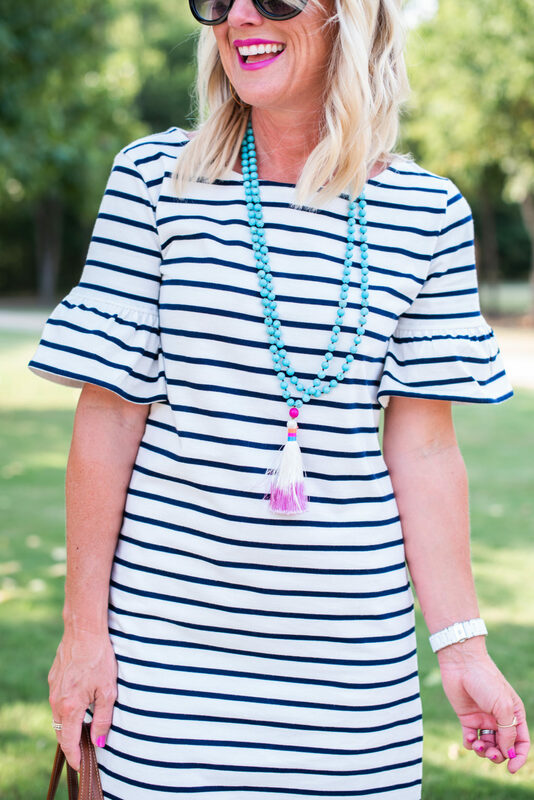 My best friend just gifted me that necklace and I hadn’t thought to pair it with my striped dress. Thank you for the inspiration! Love the dress on you, so precious. I have to admit, my youngest son is a Senior this year too, and while I made lunches for his older brother until he finished high school, I’m trying to put a stop to it this year. He’s a great little cook and a bit of a “foodie”, so I’m passing lunch making onto him….late, yes, but both my boys can cook and help with family meals, so I haven’t been a total failure in the meal area….LOL!!! Just thought I’d share. Making school lunches=THE WORST! Who knows if they really eat them!